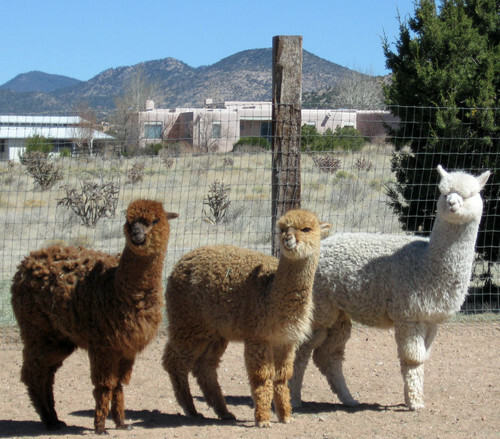 New Mexico Alpaca Breeders: Blue Mesa Alpacas, LLC is a farm located in Santa Fe, New Mexico owned by Bob & Louise Hazen. 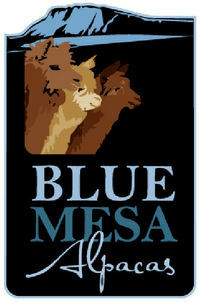 Blue Mesa Alpacas is a family-run ranch, specializing in fine alpacas from elite suri & huacaya foundation blood lines. We are one of the largest breeding ranches in New Mexico, but we maintain our focus on personalized attention. Our ranch is located just off of I-25, only a 15-minute drive from downtown Santa Fe, surrounded by breathtaking mountain views. Our ranch is committed to a high-quality breeding program, with an emphasis on improvements in conformation & fleece quality in every successive generation. Our huacaya herdsires include males from 2 elite foundation bloodlines. From the well-known Legacy line (4Peruvian Legacy 6016, now deceased) we have a medium fawn Legacy grandson, BlueMesa Aftershock, sired by Crescent Moon's Shockwave, with award-winning beautifully fine fiber plus fantastic presence. From the famous Caligula line (Pperuvian Caligula) we have a stunning silver grey herdsire, BlueMesa Silver Titan, out of Misty Ridge's Silver Quest, a Caligula grandson who has produced a number of color champions, along with white full Peruvian BlueMesa Lou, out of light fawn BRCR's Peruvian Ricochet, another Caligula grandson. On the suri side, we have 2 outstanding herdsires. Our true black Wild West’s Wyatt Earp is a blue ribbon winner – he’s a Silver Bullet grandson out of Greycliff Jax with strong silver grey genetics on both his notable sire’s and dam’s sides. BlueMesa Marquis is another true black with exceptionally fine fiber, a full Peruvian grandson of the well-known silver grey Platinum Marquis. Last but not least, we have newcomer MMALP Silver Stones Lotus, a Silver Heat grandson out of Silver Stone who has brilliant medium grey coloring – Lotus is a multiple Reserve Champion winner & ready to go to work at our ranch! 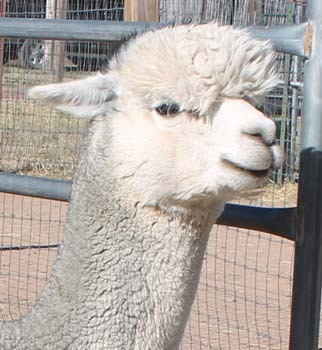 Blue Mesa Alpacas offers a wide array of services, including breeding, sales, agisting, mentoring, brokering, Alpaca farm tours & a farm store. 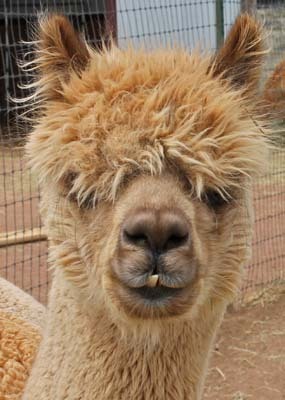 We welcome visitors, & are always happy to show them our beautiful herd & chat about alpacas. Our tour hours are from 11 - 4:00 pm Wed. thru Sunday and Monday - Tuesday by appointment. Give us a call, e-mail us and check out our web site at www.bluemesaalpacas.com for directions, email address or phone number- we'd love to hear from you. We offer liberal financing on single, multiple and package purchases, duration and interest dependent on sale price. Discounts available to NMAB members. Bob & Louise Hazen moved to Santa Fe, NM from Florida in 2005. We established Blue Mesa Alpacas in 2006, with our herd quickly growing in size (now over 50 alpacas in all, including both huacayas & suris). In addition to our herd of alpacas, we also raise & train horses, and we are a rescue site for gaited horses, primarily Peruvian Pasos (a spirited mid-size breed ideal for comfortable trail riding) - see our horse website www.bluemesaranch.com for more on our horses. Other animal life on the ranch includes 2 Great Pyrenees dogs (Pyrs make wonderful guardian dogs for alpacas), 2 indoor cats, & 2 barn cats! And last but not least, 2 super-cute little mini-mules, Romeo & Juliette.